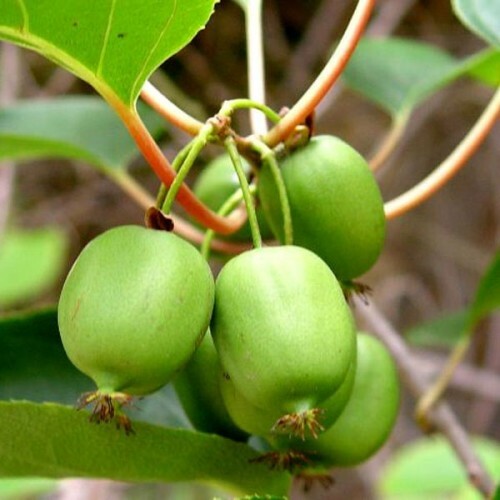 Actinidia Arguta Issai-Hairless Kiwi Fruit- is a deciduous climber with simple ovate dark green leaves. It bears small cup-shaped, fragrant white flowers followed by edible yellow green fruit. It is self-fertile. Issai is a self-fertile variety of the so-called mini-kiwi. This means that unlike the other Kiwi species it does not need a male and a female plant to produce fruit. Apart from tasty fruit it is a nice plant, too, with deep green leaves and scented flowers in June.It is a vine that is less vigorous that the species. It bears smooth-skinned fruit of the same taste and shape like kiwi, only smaller: 4-5 cm. They are green and ripen gradually from end September until end October. They are the sweetest when picked after they have softened a little. You can also pick up harder fruit, put in a bag along with other fruit producing ethylene (e.g. apples) and keep them at room temperature. They will ripen up in a few days. Thanks to its smaller size they get much sweeter than its larger-fruited relative.Pruning is best done in late winter or late summer to prevent from bleeding sap. Kiwi needs a sunny and warm site with semi-fertile, acidic, fresh soil. Do not over-fertilize: such plants flower very reluctantly. This variety was bred to sustain frosts of -29°C (USDA zone 5). These are not easy to sprout. Please be aware of that before buying them.